Eh bien, mes amis, could this really be a new Agatha Christie? Could this really be a lost Hercule Poirot story, published for the first time by Witness Impulse, HarperCollins’ digital mystery imprint? Well, yes and no. For, in truth, the story goes something like this. Back in 1954, Ms Christie agreed to write a story, the proceeds of which would be donated towards the purchase of new stained glass windows for her local church. Hercule Poirot and the Greenshore Folly, a novella featuring the great Belgian himself was the result. So, why is it only now being published, I hear you cry. Well, dearly beloved, this may come as a shock but, what with it being that awkward beast, a novella, neither short story fish nor novel fowl, not even Agatha herself could get anyone to publish it. She liked the story though and turned it into a full-length novel, Dead Man’s Folly, with the church receiving the proceeds of Greenshaw’s Folly, a Miss Marple story in its place. And that’s the rub for, although technically a new story, Hercule Poirot and the Greenshore Folly will be immediately recognisable to anyone who has read (or seen) Dead Man’s Folly. For those who haven’t, the story opens with M. Poirot receiving an urgent cry for help from his friend, the mystery writer Ariadne Oliver. Rushing down to the titular Greenshore House, he finds that Mrs Oliver is engaged in devising a murder mystery for the village fete and that the most serious thing that has actually happened is that she has had a premonition. Of course, the premonition is borne out when the lady of the house goes missing and the fake corpse in the murder mystery turns out to be very dead indeed. Cue Poirot and cue a classic Christie mystery. 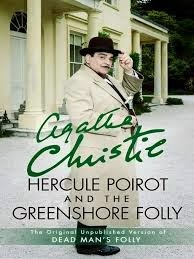 Although it’s only half-true to describe it as a lost work, Hercule Poirot and the Greenshore Folly is a thoroughly enjoyable short read that will appeal to lovers of Golden Age detective novels as well as to Christie fans. Just make sure you haven’t read or watched Dead Man’s Folly recently. I’d like to thank Witness Impulse for allowing me to read this via Edelweiss. Here I am, based in Belgium and I've never read a Poirot book, even though. I'm a big fan of the TV series. I watched The Curtain a few weeks ago and got all teary. Always thought that I'd start with Orient Express - or shall I start at the beginning. What say you? Alex - I don;t think there's any real benefit to reading them all in order as, other than the Mystery at Stiles and Curtain, there's little sense of chronology. Having said that, some of the later books give away the solutions of some of the earlier books which could be inconvenient. Orient Express and Death on the Nile are probably the most well known two because of the Ustinov films but you may prefer top start with one of the others. The Murder of Roger Ackroyd is the most innovative Poirot novel (IMHO)and I think that Five Little Pigs is probably the most subtle and "literary". I would avoid the Big Four (I actually don't think it's any good). The ABC Murders is excellent, as is Death in the Clouds, but my personal favourite Poirot novel is probably Cards on the Table. Alternatively, you could try one of the short story collections - I do like Poirot Investigates - and Poirot's Early cases includes the Chocolate Box, which is set in Brussels when Poirot was a detective in the Belgian police force. These are just personal opinions though and I am sure that others would differ! H have not read any Poirot books but have read several Miss Marple books. I have planned to read more of Christie's work but just haven't. Your review makes them more enticing!